The LimeSDR family of software defined radio boards requires drivers to be installed before it can be used on platforms running the Microsoft Windows family of operating systems. Follow these instructions to download and install the driver before trying to use the LimeSDR for the first time. Those using LimeSDR hardware on Linux or macOS can skip this step and move on to LimeSDR Firmware Management to upgrade the LimeSDR's firmware and gateware. The LimeSDR Mini uses an industry-standard FTDI chip for USB communication. In most cases, this driver is already available on Windows and the LimeSDR Mini can be used without manual installation. In the event that the default FTDI driver provided with your Windows installation does not operate correctly, please install the latest version as detailed below. Download the latest version of the FTDI driver from the FTDI website. 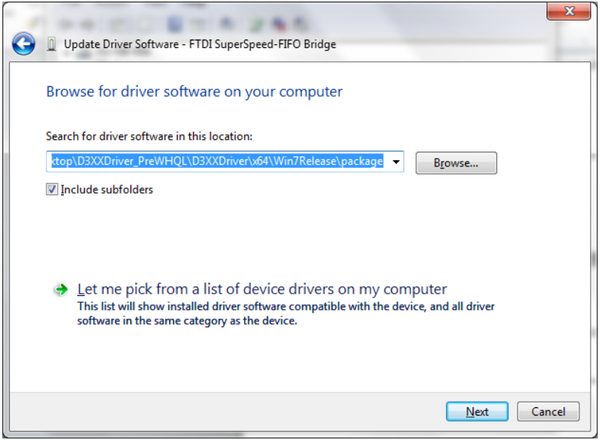 The name of this archive will depend on the version available, but should begin "FTD3XXDriver_WHYQLCertified". Extract the archive using Windows' built-in archive management or the tool of your choice. Connect your LimeSDR Mini to your host PC, if you have not already done so. Wait a few seconds for Windows to detect the device, then click on the Start Menu or press the Super key on your keyboard and type "Device Manager" followed by the Enter Key. In the list of device categories in the Device Manager window, expand "Other devices" and find "LimeSDR Mini" in the list. 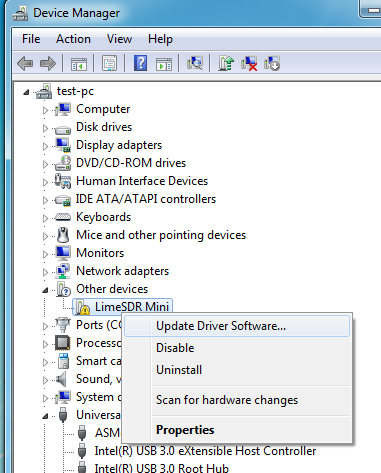 Right-click on this device then left-click on "Update Driver Software" to load the driver installation dialogue. If you have a 64-bit Windows installation, first navigate to the "x64" subfolder followed by the folder which matches your Windows version. Click "OK", then click "Next" to begin driver installation. A security dialogue may appear; if so, grant permission for the installation to continue. After a few seconds, Windows will display a dialogue confirming that the driver has been installed. To confirm that the driver has been successfully loaded, click "Close" to return to the main Device Manager window. 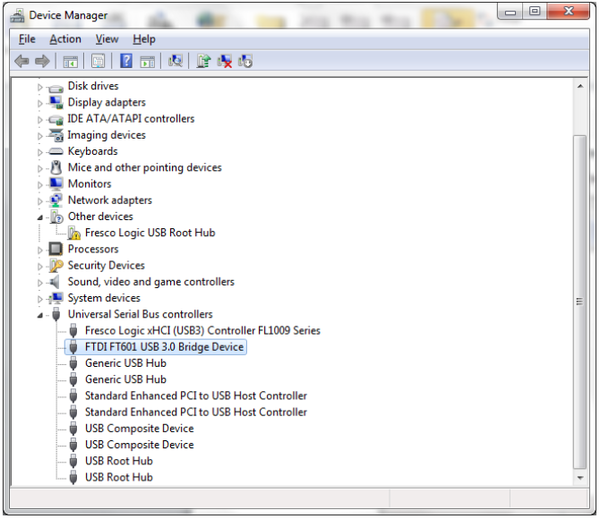 Expand the device category labelled "Universal Serial Bus controllers" and find "FTDI FT601 USB 3.0 Bridge Device" in the list; its logo should be a USB connector with no exclamation mark or other warning symbol present. If the device does not appear, disconnect the LimeSDR Mini from your system and reconnect it to refresh Device Manager. The LimeSDR USB uses a special chip, known as the FX3, to handle USB communications. 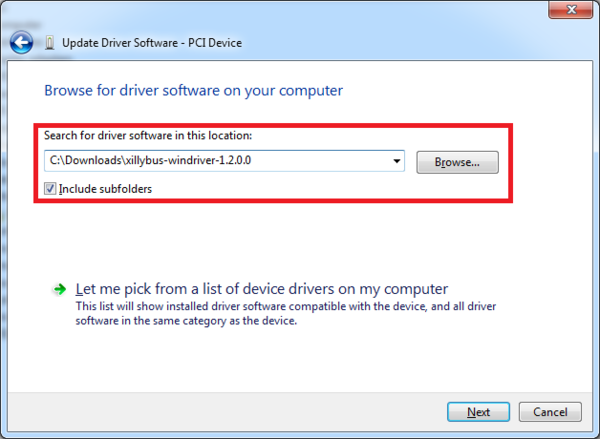 This requires the installation of a specific driver, detailed below. Download the latest version of the LimeSDR USB driver from the Myriad-RF GitHub repository using this link. The name of the archive will be "Windows-drivers-master.zip". Extract the archive using Windows' built-in archive management or the archive tool of your choice. Connect your LimeSDR USB to your host PC, if you have not already done so. Wait a few seconds for Windows to detect the device, then click on the Start Menu or press the Super key on your keyboard and type "Device Manager" followed by the Enter Key. 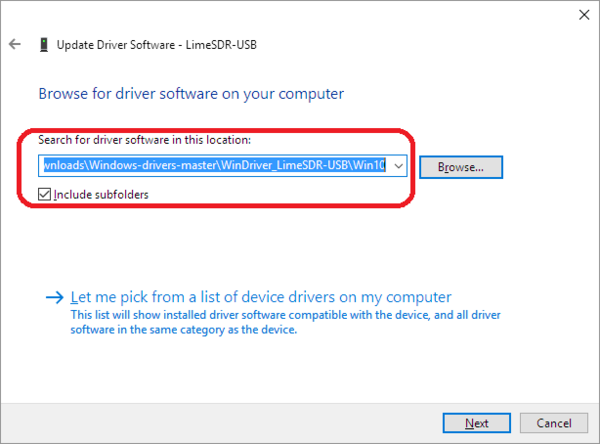 In the list of device categories in the Device Manager window, expand "Other devices" and find "LimeSDR-USB" in the list. 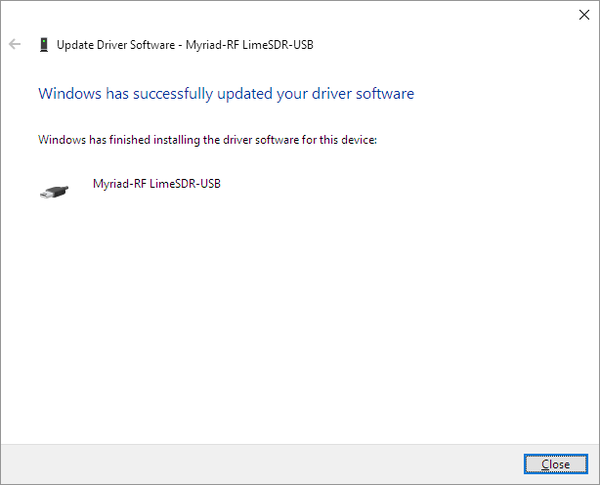 Right-click on this device then left-click on "Update Driver Software" to load the driver installation dialogue. To confirm that the driver has been successfully loaded, click "Close" to return to the main Device Manager window. Expand the device category labelled "Universal Serial Bus controllers" and find "Myriad-RF LimeSDR-USB" in the list; its logo should be a USB connector with no exclamation mark or other warning symbol present. If the device does not appear, disconnect the LimeSDR from your system and reconnect it to refresh Device Manager. Make sure that both the power and data USB connectors are plugged into your host PC, as inadequate power can cause the LimeSDR USB to fail to operate correctly. The LimeSDR PCIe uses a Xillybus FPGA core for USB communication. Before this can be used in Windows, it must be manually downloaded and installed..
Download the latest version of the Xillybus driver from the Xillybus website. The archive will be called "windriver-1.2.0.0.zip". Extract the archive using Windows' built-in archive management or the tool of your choice. Install the LimeSDR PCIe into your host PC, if you have not already done so. Click on the Start Menu or press the Super key on your keyboard and type "Device Manager" followed by the Enter Key. 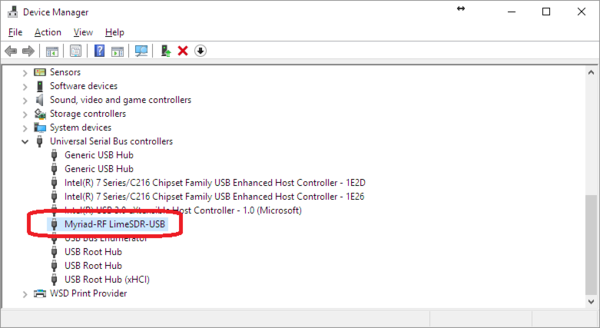 In the list of device categories in the Device Manager window, expand "PCI Devices" and find "LimeSDR-PCIe" in the list. 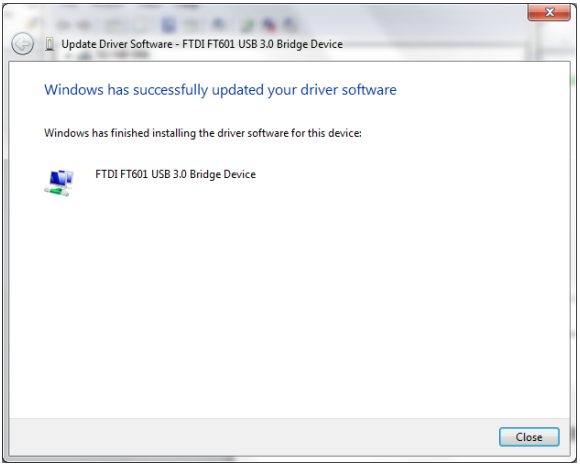 Right-click on this device then left-click on "Update Driver Software" to load the driver installation dialogue. To ensure that Windows loads the correct driver, choose "Browse my computer for driver software" from the window that appears. Click the "Browse" button, then browse to the folder to which you extracted the driver archive. You do not have to select a subfolder for your platform architecture; the driver installation will automatically select the correct version. To confirm that the driver has been successfully loaded, click "Close" to return to the main Device Manager window. 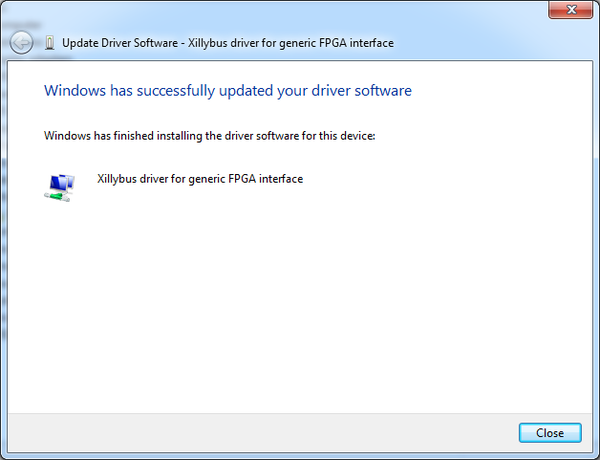 Expand the device category labelled "Xillybus" and find "Xillybus driver for generic FPGA interface" in the list; its logo should be two monitors on a bus connector with no exclamation mark or other warning symbol present. If the device does not appear, reboot your computer to complete installation. With the driver installed, you can move on to LimeSDR Firmware Management to learn how to update the firmware and gateware on your LimeSDR.